Ah, the self-confidence of a three-year-old! Last night I had Luke in stitches recounting an incident earlier in the morning at the gym. We took both girls to the gym for Family Day. It’s become our favorite weekend routine to bring Chiara to the pool, and we’ve already started to do this with Jemma, who stays in the water for all of two minutes before it gets too cold to be safe. Chiara has made quite a few friends among the other families, and yesterday, the first weekend back since Labor Day, there were a lot of families present. One girl in particular reminds me of Chiara, though she is three years older. She has the same exuberance tempered with a great deal of affection. She and Chiara can often be found hugging each other and sometimes have to be told not to hug others, because they have such strong embraces and don’t always know their own strength. Anyway, this friend, her father, Chiara and I were all in the pool together when the friend called Chiara and me to attention. “Watch this,” she cried, and did a forward flip in the water. Then, still treading water, she cried, “Watch this,” and did a backward flip in the water. It was very impressive. 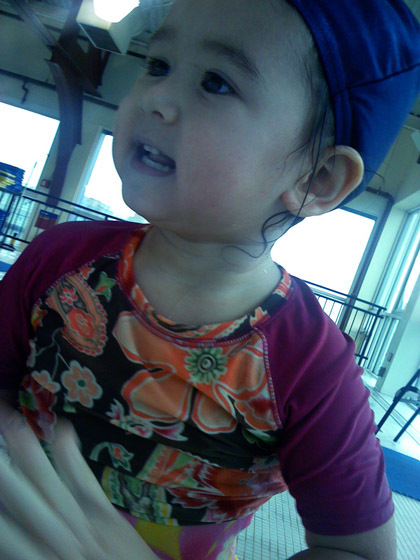 I asked her father if she took swimming lessons but she hadn’t, she just taught herself through sheer enthusiasm. My daughter, despite wearing a dayglo pink swimsuit with built-in flotation devices to keep her head above water, was not to be outdone. “Watch this!,” she cried, and then turned clockwise while paddling her arms and legs. Her head remained perfectly dry. There was more. “Watch this!,” she cried, then paddled herself counter-clockwise, too. “That’s easy,” her friend said, with some disdain in her voice. But Chiara didn’t notice or seem to care. She was very pleased with herself. Chiara at the pool in early August, sans floaties.